As well as regular and unplanned maintenance, our Service department offer full refurbishments on old equipment and have the expertise to refurbish not only Whitham Mills’ machinery, but other brands too. Whitham Mills’ Service and Maintenance team understands the demands placed on our customers’ equipment. Machinery needs to be robust and reliable, ensuring it meets their needs throughout its lifetime. So why refurbish your existing baler as appose to a full replacement for new equipment? Replacing an existing baler with a new one is a big investment, not only in monetary terms but also downtime. 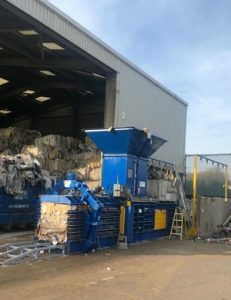 Refurbishing an existing baler to extend its lifespan sometimes makes more sense to a business that relies upon the operational efficiency of that equipment but does not want the big expenditure that comes with a new baler. If your existing baler is meeting your current baling demand you may want to think twice about purchasing a new machine. A refurbishment on your existing equipment is a great option for some customers who want to continue baling the same materials but reduce unnecessary downtime which comes with older machinery. Refurbishing old equipment also allows a business to plan ahead. Extending the lifespan of existing equipment means you can prepare for the expense of new equipment when you’re ready for a replacement.